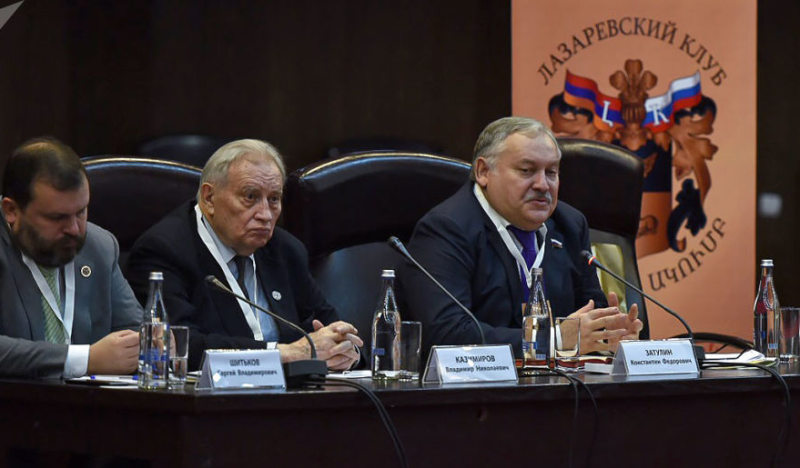 Ahead of the crucial December 9 parliamentary election in Armenia, Yerevan played host to the first meeting of the Lazarev Club, made up of Russia’s pro-Armenian politicians and pundits, who carried the Kremlin’s messages to Armenia. The conduct of the first meeting of the Lazarev Club indicates that in essence it carries no weight with local politicians and will in no way play a role on security and defense issues it allegedly discussed at the first meeting in Yerevan. Hopes are high that in the changing geopolitical situation, Armenia will not be under Moscow’s influence to host the next meeting to “discuss the Naxcivan issue” as Armenian news agencies claim with reference to chats on the fringes of the forum. “The Karabakh problem was publicly discussed, and according to rumors, representatives of the Russian side spoke about Naxcivan and assured that at the upcoming meeting they would turn to the Russian-Turkish Moscow Treaty of 1921, according to which, the Armenian lands were transferred to Turkey and Azerbaijan,” Armenia’s Lragir.am news agency claimed. At the same time, if the club really intended to strengthen relations and the Armenian-Russian friendship, then without revising this agreement is not enough, the agency says. Obviously, without solving this task, the Armenian-Russian friendship will remain a thousand-year phantom, a fiction. Nothing more! It is possible, for example, to discuss the possibility of preferentially recruiting officers and commanders under the principle of Armenian origin. Just as in Russia, according to the principle of origin, Armenians are not allowed to occupy leadership positions at municipal and federal bodies in places of compact residence, and since 2014 they cannot stand for the State Duma, the agency says. As you see, appetite comes with eating and Armenia wants to have the Russian military base manned by ethnic Armenian officers and commanders with all costs covered by Moscow. A real Armenian approach though they are fully aware of the reality that the Russian base in the remotest end of Armenia is not to protect Armenians from any hypothetical enemy but serve the Kremlin imperialist ambitions. With all similar missions and promises with involvement of the so-called Russian elite and politicians backed by Armenian lobbyists, the winner will at the end of the day will be Moscow and interests will be served by corrupt politicians and money bags and the loser as always rank and file Armenians scattered around the country cold in winter without gas and electricity except for a couple of cities and districts. The Kremlin bag is full of surprises and they will be made public as a time comes since Moscow is not delighted with Pashinyan, but continues to inundate Armenia with arms. Relations between Moscow and Yerevan are going through another intriguing stage. On December 6, Nikol Pashinyan will leave for St. Petersburg, where he will take part in a meeting of the Heads of State of the Eurasian Economic Union (EAEU) and the CIS. It would seem a routine meeting, especially for the EAEU member country, but this time it is impossible to recall it so: on November 27, a meeting of the Council of Heads of Governments of the EAEU was held in Minsk. And Nikol Pashinyan refused to go there: he took a short-term leave to join the election campaign just from November 26 to December 5. However, no one doubts: in this way, Yerevan demonstrated that it was deadly offended by Minsk, which, first, supplied weapons to Azerbaijan, and second, they discussed with Baku a very painful issue for Armenia – the election of the CSTO general secretary. Until recently, this post was occupied by the representative of Armenia Yuri Khachaturov, but a criminal investigation is being launched against him and he was recalled from the post of the general secretary, and now in Yerevan, they would like to appoint a representative for the remaining period of Khachaturov in the post, but. It was assumed that the issue of the Secretary General will be considered and finally resolved on December 6 in St. Petersburg, where the CSTO summit will be held simultaneously with the summit of the EAEU and the CIS. But now Nikol Pashinyan at his rally, this time in the Vayots Dzor mazd, said in a dejected tone that Russian President Vladimir Putin during the latest telephone conversation proposed to postpone the CSTO summit, which was to be held on December 6 in St. Petersburg. We wonder what are scenarios and how will things develop further? Does the transfer of the summit mean that Armenia has a “toy” in the form of a post of the Secretary General that was taken away not for a while, but forever? And most importantly, is the change in attitude towards Armenia in general behind this? Russia does not particularly hide its dissatisfaction with the “team” in Armenia. Commenting on the visit of the representatives of the Lazarev Club to Armenia, the Yerevan-based Hraparak wrote: “Russia is concerned that pro-Western and pro-Soros forces, first of all, of course Sasna Tser and pro-European politicians will dominate the next parliament. Moscow as a challenge to it considers several people who have the reputation of key representatives of the Soros Foundation and are included in the list of Civil Contract. And the members of the Lazarev Club, in the opinion of Hraparak, arrived in Yerevan to sort out the situation. Here, of course, it is appropriate to inquire whether such a character as, say, Zatulin is able to “understand the situation”. But here the meeting of the Lazarev Club without representatives of the Armenian authorities was an eloquent “message”: Moscow is dissatisfied with Pashinyan. Theoretically, the reasoning here should follow that such a turn of affairs for Armenia is an important “message”, that after losing the “toy” in the form of the post of the CSTO Secretary General, it would be worth for it to think whether the military and military-political guarantees are in effect. But on the same days, Acting Defense Minister David Tonoyan said: Armenia and Russia are finishing preparations for concluding a contract for the supply of Su-30SM fighter jets to Yerevan. “We try to make it very fast. We are approaching the final phase of signing the agreement,” he said at a meeting with Russian journalists. As Tonoyan assured, the two countries at the domestic level are completing the procedures for implementing the agreement on providing Armenia with a Russian loan of $100 million for the purchase of weapons, in particular, the supply of specific types of equipment. “At this stage, the negotiation process is being brought to completion; domestic procedures are underway, both in Russia and in Armenia. We are approaching their completion,” news agencies quoted him as saying. The easiest way, of course, is to declare that David Tonoyan simply “trolls the neighbors” and gives what he wants for the reality. And to add that the Su-30SM is too an expensive toy, the announced amount of the loan - $ 100 million - does not allow Armenia to purchase a full-fledged squadron, and one or two jets will not change the situation in the current situation. And most importantly, regardless of whether Russia will provide Armenia with new Su-30M or “biplanes”, this does not change the main point: Moscow got “spanked” publicly by its outpost after the story with the secretary-general and is happy to see Moscow supply it with new weapons. As for Pashinyan, "the unshaven king of the streets" is not particularly appealing to Moscow, except that he is not the only player in the Armenian political scene. Russia may well correct the situation, including much more “traumatic” methods for the Pashinyan team than the meeting of the Lazarev Club without representatives of its government.